Did we really think that this would not be the case? WASHINGTON – Americans can keep guns at home for self-defense, the Supreme Court ruled Thursday in the justices’ first-ever pronouncement on the meaning of gun rights under the Second Amendment. The court’s 5-4 ruling struck down the District of Columbia’s ban on handguns. The decision went further than even the Bush administration wanted, but probably leaves most federal firearms restrictions intact. I am not a gun fanatic! No matter what, I feel as though every law-abiding citizen should have the right to bear arms and in fact should be encouraged to do so for the betterment of society as a whole. 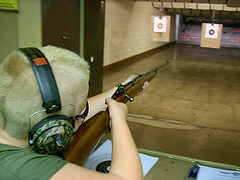 Why not teach kids how to shoot a gun in gym class? My high school used to have a gun range in the basement of its old campus but now that it has become a bastion of ultra-liberalism, I’m sad to say that the new campus has a pottery studio instead. Perhaps living in Texas for a few years helped to shape my ideals but over time I have come to feel as though gun ownership, the right to carry and the Castle Doctrine that allows for unfettered self protection within one’s own home, are all good for society. Because some ignorant would be criminal might just think twice before they use their illegal gun to perpetrate a crime against the possibility of encountering a well armed, well trained, law abiding citizen. Here in New Jersey, if you dare to hurt a criminal as they invade your home, you might just face a lawsuit and if the amount of force you use to repell the invader exceeds the amount of force they use to assalt you, you may even go to jail. If we win, people like Mayor Bloomberg will simply have to accept that the Constitution is on the side of the people and NOT on the side of the criminals who have always and will always have free access to all of the guns they want. The problem with criminals is that they have all the guns! As a card carrying member of the NRA, a one-time Texan and generally a believer that people kill people, not guns, I am very upset about the enormous amount of anti-gun rhetoric that I have been reading in the aftermath of yesterday’s tragedy in Virginia. Living in New Jersey, a state where I’m sure more criminals own guns than law abiding citizens, I feel as though I am surrounded by people who are so naïve that I often wonder if they still believe in Santa Claus, the Tooth Fairy and Peter Pan. If law abiding citizens carried guns more often, rampaging psychotics like this young man in Virginia might just be “taken out” well before such a huge number of innocent people could have ever been killed. When criminals decide to strike, knowing that their prey is unarmed and otherwise helpless only emboldens them and puts them in a position of ultimate power. As Lord (John Emerich Edward Dalberg) Acton states…. Why do we think that keeping guns out of the hands of law abiding individuals makes an ounce of difference relative to what criminals might do? In my opinion, we need guns in the hands of properly trained people to protect all of us from situations like this!